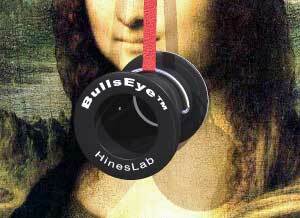 The BullsEye™ developed by Steve Hines provides a quick way to center a camera to flat artwork, to prevent a keystoned image. The typical approach for squaring the camera with the art work involves using a tape measure to raise or lower the camera to the center of the artwork. Matching the lateral position of the camera to the center of the artwork can be done with a right angle reference to the wall. However, if a photographer is photographing paintings which hang at an angle from the wall, camera alignment becomes more complicated. Simply centering the object in the camera's viewfinder does not guarantee a rectilinear image. The camera's lens axis must be perpendicular to the plane of the artwork which assures that the film plane will be parallel to the artwork, and that the rectangular original art will be rectangular on the film. The BullsEye™ is made in the shape of a hollow spool. A mirror is attached at one end, facing inward. A curved wire handle loosely holds the device by side holes at its center of gravity. A cloth strap, attached to the wire handle, holds the BullsEye™ from above. The pressure against the artwork is a small fraction of the 3-oz. weight of the BullsEye™. Step 1: Hand hold the BullsEye™ in the center of the artwork. Step 2: Pull the loose end of the cloth strap upward and pin it to the wall, or drape the strap over the frame allowing the counter weight to hold its position. The mirror of the BullsEye™ automatically settles flat against the artwork to be photographed. Step 3: Position the camera in front of artwork, at the required distance to photograph the whole painting, with the camera's reflection visible in the mirror of the BullsEye™ viewing through the single-lens reflex viewfinder, or the LCD of a digital camera. Step 4: Remove the BullsEye™ from the artwork and take the picture. As used above, the cloth strap is draped over the top of the painting and the rubber ball counter weight, at the far end of the strap, holds the BullsEye™ in position. A felt backing on the mirror prevents damage to the painting. Hines' p. 58 lab notebook entry for this invention. This is a technology announcement and license offer, not a product for sale to end users. Photographic equipment manufacturers are invited to contact Steve Hines to arrange a demonstration or to discuss a manufacturing and sales license.